“Toshiba has made a significant advance toward the realization of light, flexible solar modules that can be used in diverse locations by fabricating a perovskite solar cell mini module(Note 2) with the highest energy conversion rate yet achieved. Perovskite solar cells have a light harvesting layer formed with crystals of a compoun with a perovskite structure. Such compounds are easily and cheaply manufactured, and offer good development potential in terms of energy efficiency. The main concerns are to increase cell size and to boost the energy conservation rate. Toshiba has achieved both by developing a 5-square centimeter cell that delivers an energy conversion efficiency of 10.5%(Note 1), the highest yet realized in a multi-cell mini module. 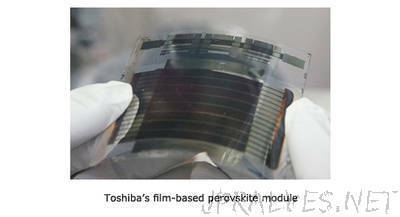 Toshiba achieved this advance by developing a fabrication process technology for film-based perovskite solar cells. The technology uses a film substrate and scribe(Note 3) process technology based on organic thin film solar cell(Note 4) module fabrication. Since this technology uses a flexible film substrate, it allows roll-to-roll fabrication that reduces costs. Toshiba will continue to refine the technology and expects to see further improvements in efficiency. These results were obtained as part “Development of high performance and reliable PV modules to reduce levelized cost of energy” from the New Energy and Industrial Technology Development Organization (NEDO). They will be presented at the NEDO results report meeting, to be held at the Pacifico Yokohama Annex Hall in Yokohama, Japan, on 22 September. Crystalline silicon solar cells are the most widely used solar cells, but their arrays are heavy and inflexible, which restricts where and how they can be installed. Arrays of flexible, lightweight modules would increase the range of options, including extending installation to buildings with low load endurance, and installation on walls to help to realize net zero energy buildings and houses (ZEB(Note 5) and ZEH). Equally important, perovskite solar cells offer the promise of high conversion efficiency(Note 6)allied with reduced module costs, as they can be fabricated by printing. To date, there have been two main roadblocks to developing film-based perovskite solar cell modules: the difficulty of forming large, uniform perovskite polycrystalline layers; and the inability of the scribe process to remove the layer formed on top of the electrode─the flexibility of the film substrate prevents application of the strong blade pressure required for removal─which increases the resistance between cells and decreases conversion efficiency. As a result, modules formed on a film substrate have been difficult to fabricate and have had low conversion efficiency; there have been few reports on the technology(Note 7). Toshiba successfully applied a novel printing technology to fabrication of film-based perovskite solar cell modules, and achieved a 10.5% conversion efficiency in a 5X5cm module, the highest ever recorded. Since this technology forms the substrate with a resin film, such as polyethylene terephthalate, a planar inverted structure (Figure 1) that can be fabricated at a temperature under 150℃ is used for the cell structure. Toshiba addressed the problem of increasing the area by applying meniscus printing technology developed through R&D of organic thin film solar cells, and succeeded in forming a uniform thin layer of methylammonium lead iodide(Note 8). This increased the efficiency of modules by reducing variation in properties between cells. Toshiba’s researchers also succeeded in increasing energy conversion efficiency by reducing the resistance between cells to the same level as with a glass substrate, through a combination of optimizing blade pressure during the scribe process, and also using materials that allow the layer covering the electrode to be removed even when blade pressure is weak. The reduced sheet resistance of the indium tin oxide transparent electrode developed for the resin substrate also contributed to increased efficiency. Having demonstrated the possibility of increasing area and efficiency of a film-based module, and achieving a conversion efficiency of over 10%, Toshiba will now focus on increasing the module size and conversion efficiency, through measures including changing the composition of the perovskite material and by process improvements.